Indeed it was, for I was there on that crisp, clear morning as the first bright rays of the sun began to creep between the terraces and townhouses. Out for my usual constitutional, it was an unexpected sight indeed, as I turned the corner into the lane, to find those three grass catchers lined up like panzer tanks ready to go into battle. I can’t recall ever having seen even one of these in the laneway, so to encounter three all at once arranged in single file like that… well, it’s like bumping into a stegosaurus. These guys look like they’ve seen plenty of service over the years. They’ve done their duty on the lawn, faithfully catching the clippings as, mouths wide open, they followed on behind their mowers, playing their role in the ongoing battle to keep our lawns neat and trim. Now they’re ready to be put out to grass, so to speak. Is there a future for old grass catchers? I don’t know the answer to that one but certainly the prospect seems bleak for, in my experience, mower and grass catcher are as one, a lifelong bond, brothers in action. Sure, a mower can survive, even usefully, without its grass catcher, but a grass catcher without a mower is as forlorn as a beached whale. Perhaps that is what has happened here. A mower has expired, its whirling blades falling still for ever, and as a result, the grass catcher has suddenly become expendable, useless, a catcher with no grass to catch. But why three? Is it possible that this has happened three times and that, on two previous occasions, the catcher has been set aside, saved by a lingering hope that it may one day prove to be useful until, after the third such instance, the realisation has finally dawned that there is no reprieve for these catchers? 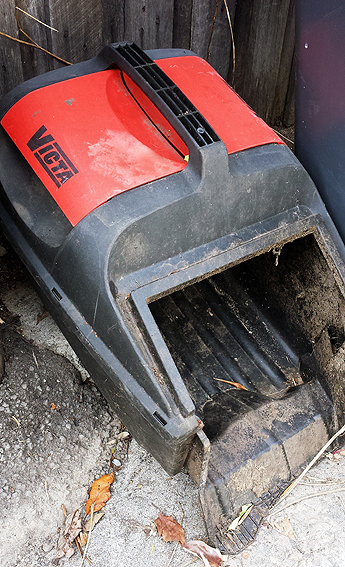 Or, even more unlikely, maybe three mowers succumbed at once, instantly leaving three catchers destitute. That seems improbable. Why would anybody have three working mowers of similar vintage which, remarkably, all decide to throw their final clip at roughly the same time, as if in sympathy with each other? Three dud mowers simultaneously – or at least in close proximity – is a coincidence beyond comprehension. No, I’m inclined to view this as an accumulation of catchers, a distinct lineage which has seen catching duties passed down from one to the other until this moment when they find themselves united in their disposal. Catchers scorned together. It’s like Lear and his fool, watched over by Kent, cast out onto the blasted heath. So there you have it. Maybe the appearance of these three amigos is simply the consequence of one homeowner who could no longer carry such a burden and so, when push came to shove, the catchers had to go. More discarded grass catchers sans mowers. Opinion is divided on whether these appearances presage another ruthless purge along the lines of the Great Cull of Spring 2011, or whether they are just one-off events, solitary grass catchers that have out-lived their usefulness. Lacking further evidence, I am inclined towards the latter view but, as ever, only time will tell.